In this podcast, Rachel Atcheson explains how the world’s demand for meat is causing great suffering to animals. To supply the 56 billion animals which are consumed each year worldwide, rearing conditions of these livestock are cramped and inhumane. Rachel Atcheson is an animal rights activist who is changing the world as a Senior Campus Outreach Director for the Humane League. In her role, Rachel oversees 30 college students who act as campus coordinators for the Humane League in universities across the USA. The purpose of Humane League is to advocate for reforms to reduce animal suffering at all levels through hard-hitting animal welfare campaigns. Rachel’s passion for campaigning for social movements began during her time at Boston University where she obtained a Bachelor degree in Philosophy. Her academic talent and vocal campaigning on campus lead her to be awarded the Peter A. Bertocci Award for Academic Achievement and Humanitarian Service. Thanks to Rachel’s efforts and strong leadership skills at The Humane League, there have been major victories in the reduction of meat consumption and the factory farming of animals. Why is meat consumption a problem? Rachel does not say that eating meat is a problem full stop. However, she argues that it is the amount of meat we are eating that is causing an issue. Because humans are eating so much meat, farmers have to rear huge amounts of animals to cater for this exceptional demand. With limited space and resources, animals are being holed up in cages with no space to move so that farmers can produce the most meat as possible on their land. The podcast gives examples of pregnant pigs not being able to move at all for up to four months in their tiny cages and chickens having their beaks cut off so they can’t peak other hens in the overcrowded huts they are locked in. One of the biggest problems is that a lot of people are not educated about how their meat is produced. As the world is full of dreamers, it is unlikely people would keep consuming meat in the quantities they do if they were aware of how these animals were treated whilst they were alive. This is why Rachel tries to spread awareness of animal farming so others can learn the negative impact meat-eating has in the world. The good news is, there are already numerous steps being taken that are changing the world and reducing meat consumption. 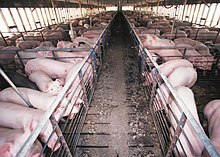 In the USA, meat consumption has recently decreased from 10 billion animals a year to 9 billion! One global initiative to reduce meat consumption is the “Meatless Mondays” project that encourages people to go meat-free one day a week. From this, people will explore the world of vegetarian meals and gain ideas on how to cook and eat without the need for meat. There are also numerous, “meat-alternative” options on the market such as quorn. These meat substitutes are in fact better than eating the real thing as they are packed full of protein and are low in fat and cholesterol. Even further developments are being made in the meat-substitutes market. SuperMeat, an Israeli start-up, is currently the quickest growing vegetarian / vegan project. Their goal is to make food that tastes exactly like meat so there is no justification to ever kill animals for food. SuperMeat takes cells from animals and grows these cells into real meat in a laboratory, harming no animals in the process. This new project has recently met its first goal to reach $100,000 of development funds! There are so many steps you can take to improve the welfare of farmed animals. You can cut down your meat consumption by getting involved in Meatless Mondays (read more here) and learning how to cook great vegetarian meals. You can make sure if you do buy meat it’s from local, organic farmers. You could donate money to animal welfare charities such as The Humane League. Or, you could even lobby politicians and campaign for laws to be passed to protect animals. Finally, the best way to reduce meat consumption and animal suffering across the world is to make others aware of this issue. Share this article today to get your friends thinking about how they can fight this problem.